So you might have been taking your marketing and advertising lessons and you know what role a logo plays for giving identity to a particular brand. The logo becomes pervasive in each and every aspect of the brand. But what if that particular logo design is horrendous enough to put the brand in a soup? There is a common practice among great brands to change the brand logo and identity to go hand-in-hand with the present generation. But not all logo designs go well with the change. This post will be showcasing some of the eminent brand logos whose redesign has been abysmally detrimental for the brand itself. Through this post I would be showcasing few logo redesigns of some of the well known brands whose meaning got lost leaving the audiences absolutely bewildered and confused enough to tear their hair off. The original logo of AT&T was a masterpiece created by the legendary graphic designer Saul Bass. When time came for AT&T to give the brand itself a face lift, change was evident in every nook and corner of it. Even the logo was not spared. The original one had thick and thin lines crafted by the maestro himself. These lines focused on the global communications and the motion of it. When the new logo became public, it fell absolutely flat on its face. The new generation logo designer tried to simplify to go with the flow of the next generation but failed miserably. The whole logo looked like it has got steroid shots as the thin lines got bloated and the special effects got totally awry. This reinterpretation was an utter failure. Brand extension is a phenomenon which occurs every now and then which helps in introduction of product and services for the brand. 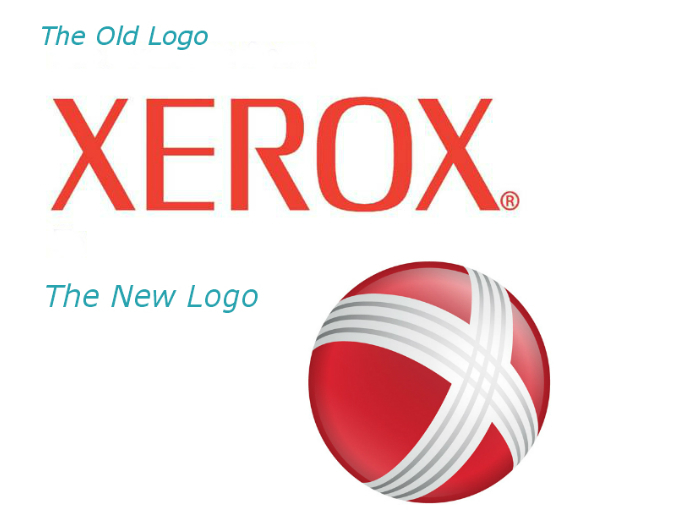 Xerox took this step and tried to prove themselves as more than just a company which produces documents and photocopy devices. The previous logo clearly spelled out the name to the readers giving them the actual implication of the company. But the new one has been a failure at that. The new logo does not exactly define where the company is headed. Being just an overly decorated X on a red ball don’t tell anything what the company is trying to say. The contours and the lines of the letter X symbolize more of a double helix rather than just a letter. Though the current one tries very hard to be overtly out-of-the box, it fails to communicate anything. It looks more like a glorified Christmas ornamentation. What happens when the most overly used colour of the United States of America are used again and again? It gets outright boring. 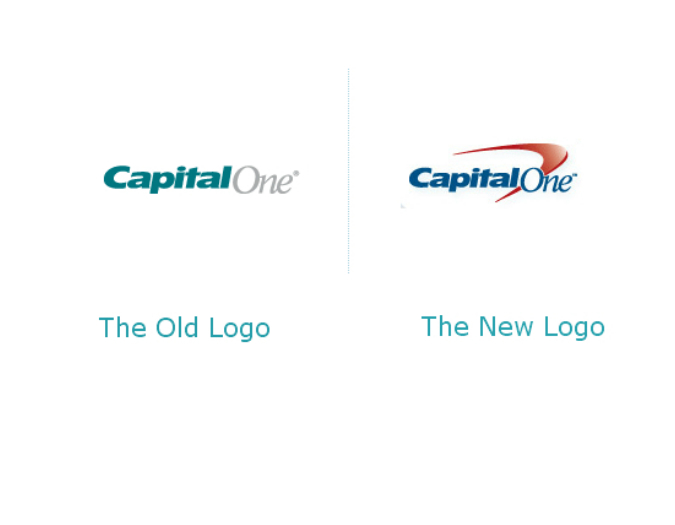 The previous iteration of Capital One was weird enough with an aquamarine green ‘Capital’ embraced by a One written in cursive fonts. The new iteration got more bizarre as well as clichéd when the designer added a ‘swoosh’ to the logo and coloured it with the most common colours in America –Red, white and Blue. But they did forget to add the stars. The new GAP logo surely left a gap in the consumer’s mind and that gap was too hard to fill. GAP is considered to be one of the darling brands to the American audience be it for a man, woman or a child. 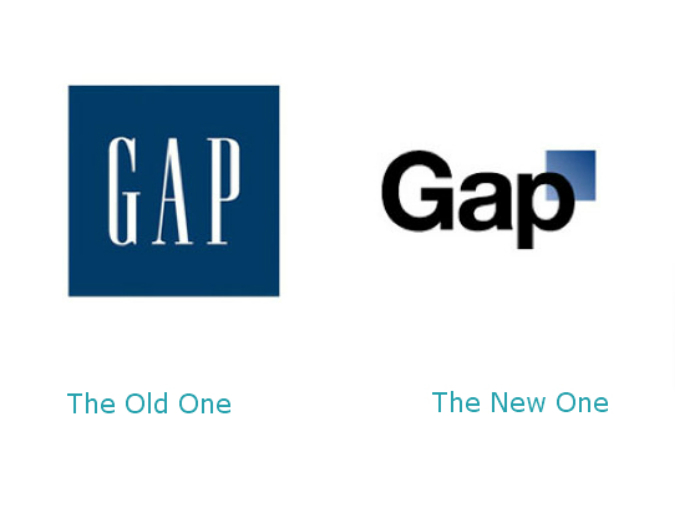 The original Logo of GAP is something which is etched in the memory of the consumer. The elongated fonts of the previous logo definitely had some personality which used to define one of the best clothing brands of the world. Once the department responsible for creating the brand identity had a change of mind and decided to restructure the logo. But the abomination they came up with was neither like the original nor could it retain its actual brand identity. The dwarfish fonts made the logo very generic, stark and void. The logo was stolen off its legendary brand personality it once had. The resurrection of the old brand was definitely on the horizon and GAP was forced to do it. One global brand which is synonymous with fruit juice is none other than Tropicana . The Tropicana’s logo had a name for its quirkiness. The orange juice had an orange on it with a straw jutting out of it. It made the whole communication much closer to the product itself. The logo has been quite common for every household refrigerators of the developed world. But one of the biggest blooper committed by the company was all about modernizing the container with a picture of a filled glass embraced by the logo placed sideways. The reception from the consumer was absolutely negative. The whole packaging fiasco made the brand lose sales in the process. The company was forced to bring up the old logo from the dead. We all love to see the wild animals frolicking in the jungle on our television. We love them raw and wild nature but from the other side of the television. This opportunity has been perfectly provided by the world favorite wildlife channel, Animal Planet. The old logo was absolutely apt for the channel though being a little bulky. The old logo comprised an elephant providing salutation to the planet earth. The natural look of the logo was derived from the green and the white colour which made it absolutely perfect. But one fine day the audiences were startled with a very unpleasant revelation after turning on the channel. The channel now had a new logo. The logo was stark, blatant and pointless. 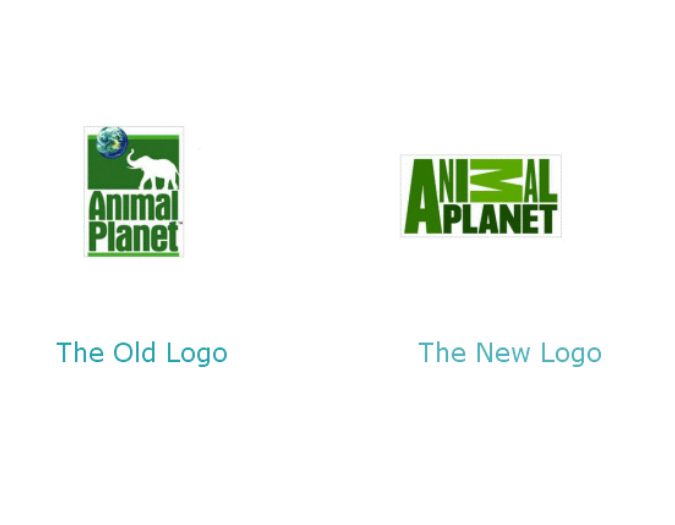 It spelt Animal planet in the ugliest fonts which can be encountered by any designers. But one thing about the new logo made it more jarring was the sideways M which looked like a handy work of a toddler, who has encountered the paint program for the first time. The logo still lives on the top right corner of the channel still making a mockery of the predecessor. So these logos have become some of the ideal types for Logo Designers around the world for being redesigned disaster. These redesigns are the ultimate examples of what not to do about a Logo redesign. The following lines of the post will take up few easy points which will help you in coming up with the perfect redesigns. a) Don’t break your sweat to go avant-garde. It will happen eventually. b) New is not always good. d) Never, I mean, never use random designs. Go for the design which goes with your brand identity. e) Colours are very important for the logo. Use them prudently for the logo designs. f) Weird and bizarre images are an absolutely no-go for the logo. g) Never use a logo which does not stand close to your product. I think by now you know how to avoid a bad logo redesign. Now pick up the logo of your favourite brand and try to redesign it on your own. Tim Bradshaw is the eccentric website designer who has been attached to Visions & Solutions since 2008. He also has been writing articles for quite some times and has covered categories such as website design and logo design. Thanks for these insights, Tim. I noticed that the first three new logos seem to look more 3D-like. Do you think the trend is going more towards a flat logo style as with Google’s flat logo? We can add one more to the list: Yahoo. Totally agree. I prefer the old Yahoo logo. 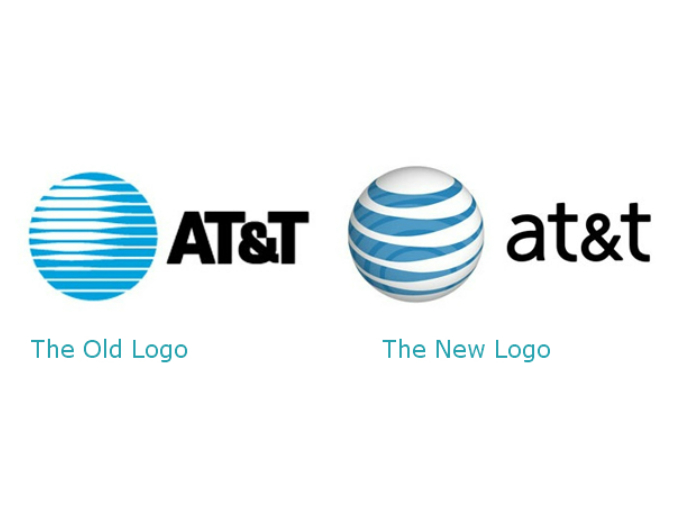 While I’m not an AT&T fan, I don’t completely dislike their new logo either. 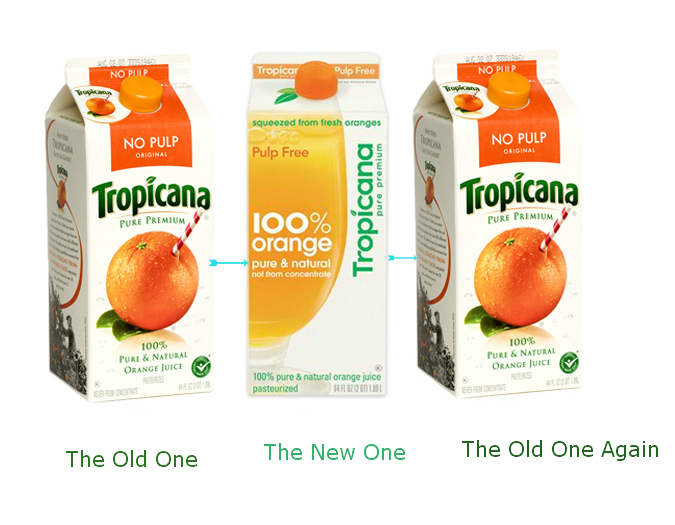 The Tropicana one was certainly a disaster, though. I do agree, at times redesigning a logo is not the best thing to do. After reviewing the logo examples you have provided I do agree the old ones were better. Thanks for providing such insightful information. I’ve seen a demonstration of well known online brand logos that are simple, flat, black text – nothing more than picking a font. I do agree as well. Sometimes trying something new with older and widely accepted one can give unexpected results. I will say most unexpected results are worst. And the most important thing is they lost their trust sometimes. Yes i am agree with agree with Nayan. The company where I am working right now has a decent logo and best web page but as time passed they thought to change their logo and web pages. Now suddenly I was surprised with the visits and comments on the site because they lost their original identity. Once again I pass my vote for this. If you change your original identity then surely you will lose your trust. I love looking at logo redesigns, but you are correct in that they are not always for the better! It’s certainly a design challenge to maintain the integrity of a mark though the evolution of a brand. Looking for a logo redesign myself, so this caught my eye. Part of what we’re dealing with, which I think affected these logos, is that people simply get used to seeing something a certain way. Even if it’s not a great logo, the more we look at it, the better it looks to us. Kind of like a human face, by the way. David, I agree it’s resistance to change that turns people off sometimes – Guilty as charged! I hadn’t seen the YMCA logo but I just took a peek and although I didn’t really understand how to interpret it, the logo seemed pretty neat, kind of a sci fi looking font.